At Lake Oswego Vein and Aesthetic, we use the Vectus Laser for hair removal treatments. The Vectus Laser is a reliable and powerful solution for people looking to remove a high-volume of unwanted body hair, and allows us to quickly and easily target unwanted hair on larger areas, such as the back. 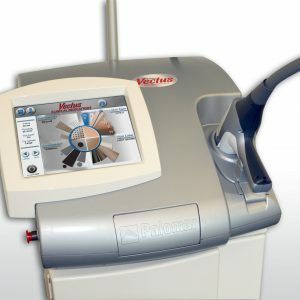 The Vectus Laser features the only FDA-cleared melanin reader, the integrated Skintel™ Melanin Reader™. This allows the providers here at LOVA to provide tailored treatments to each client, no matter your ethnicity, lifestyle, or skin type. Vectus Laser treatments are for patients who are looking for lasting hair removal. Treatments are meant to be comfortable and quick. If you are looking to remove unwanted hair from a large area like the back, this laser treatment could be done in less than five minutes. Vectus has proven reliability on a wide range of skin and hair types. We strongly recommend this treatment if you are looking for a high-volume hair loss solution. To get started, use the form below to schedule a consultation!